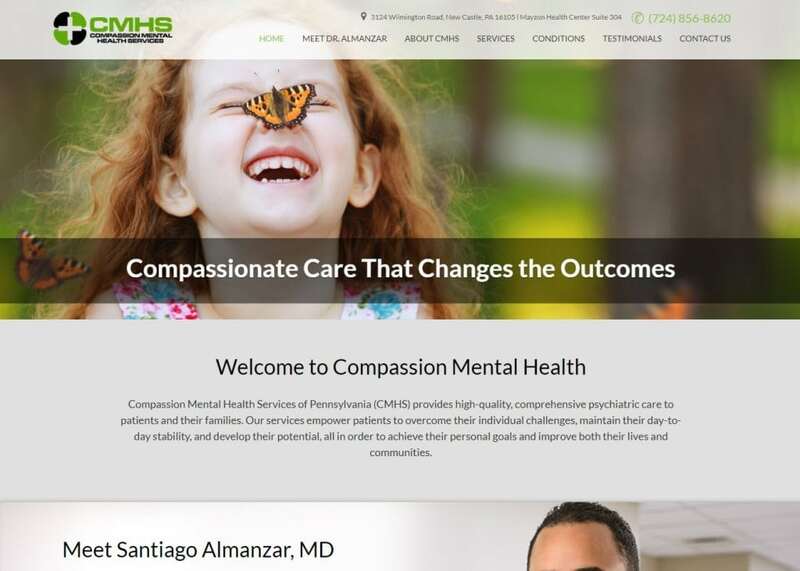 Compassion Mental Health Services of Pennsylvania provides high-quality, comprehensive psychiatric care to patients and families around the Pennsylvania community. When customizing the site design, we made sure to give assurance and comfort for incoming web-visitors. We made sure to accommodate for the mental health specialty while still creating a layout that was professional and modern. Compassion Mental Health Services of Pennsylvania emphasizes service and patient care more than anything else. Our job was to let the philosophy and core values of this practice shine through the custom website we designed on their behalf. The home page features an image gallery using parallax effects right above their mission statement. Down below, we also added Dr. Sanriago Almanzar’s educational and training experience. We rounded out the home page by highlighting the team’s featured services and a call to action with a form to schedule an appointment. Call to actions are important to creating increased web traffic Here is a how-to Youtube video on how to use CTA buttons on your own website! When dealing with mental health, you always want to ensure that the color and imagery you use on the website matches the tone you want to set for your visitors. We used a color theme that used green to highlight different calls to action on the site. The images feature laughing, care-free patients that help give web-visitors a sense of hope. We also used green in the images to match the color theme. Green represents hope, growth, and harmony – all the things patients seek on any mental health website. Here are some other examples of websites Optimized360 has successfully delivered to their clients that implement the color green. This full-screen width dental web design was created to be a highly visual representation of a modern website. Scrolling images of happy patients and smiling doctors make the practice seem more down to Earth. The service tab in particular displays all the procedures and services offered. Each service is displayed side-by-side with a professional image. When you click on the actual title of the procedure, you are redirected to an additional page that breaks down the procedure in more detail. The conditions tab also features a useful FAQ for patients who are concerned about additional details. Mental health is no joke. We wanted to make sure all the web-visitors could contact Dr. Almanzar as soon as possible for treatment. The contact tab on the navigation menu has an interactive Google Map for patients to find their estimate time of arrival to the office. There is also another form to make an appointment as well. Compassion Mental Health Services also uses SSL Security on its website. SSL Security encrypts important information such as credit card numbers and home addresses before they are sent off to the actual database. The last thing you want to deal with is credit card fraud or hackers having access to your personal information. To learn more about SSL Security, here is a YouTube that covers the topic in under three minutes.